"It makes all the difference when you have a friend that can say something is really going to be worth your time, effort and dollars! These folks left that message for you. It's a message of possibility for you and your horse. No one asked them to send their email or letter - they just did it so you could be more confident in your decision to try something different - something that works - because how we're taught makes a huge difference in our success - just like a horse! Read their messages and then decide." "At last I know I'm not crazy! Could never understand why my husband and I looked at horse riding/training so differently and couldn't understand why he didn't "get" what I was trying to say! Whooppee...looking forward to learing more about you and your techniques." "Your videos have helped me a lot with training my 3 year old mare. She is more responsive to me and what I do. It has really helped since she now has a colt. With him running wildly in circles sometimes, she'll still stay calm and then he'll calm down. Your videos have been really helpful." "Any woman who has an interest in and love of horses should attend onf of Karen's clinics because she not only taught us how to communicate with our horse but in a subtle way I realized that Karen was teaching us how to listen to our horses. When I learned to listen, the response from Reggie, my quarter horse, was almost magical. He recognized me as his leader and his sense of security and confidence measured mine and we grew together. We continue to grow as we apply Karen's techniques from her instruction on the DVD. I am overwhelmed by what has occurred. Thanks Karen." "Just met you at Red Deer and I was so impressed with you and what your message is to horse people. 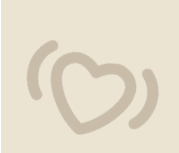 I have poured over your website and think it is fantastic. I ordered your whole set of DVD's and can hardly wait to watch them. I am so ready to apply what I know I am going to learn from you. I am definitely a sponge." "Karen is the kind of person who teaches by example without being judgmental or condescending. At the 3 day clinic my friend and I went to in October, I was amazed at Karen's accessibility and availability to all students and auditors. Even though I was the least knowledgeable and experienced with horses in teh clinic, I never doubted that I could learn with the others because Karen's teaching was not dependent on my previous abilities. On the contrary, she was there to teach me new skills and teach, she did! She didn't say, "Look how skilled I am," she said, "How can I help you to become more skilled?" Why come to any of Karen's clinics? Because you can!" "Accent continues to amaze me! In my wildest dreams, I couldn’t envision being able to do this with him. Just 6 months ago I couldn’t get him to stand still for 2 minutes, now he stands for as long as I want with his head down and completely relaxed. Every time we ride we take time to just hang and enjoy each other’s company. The days of him acting like a chipmunk on acid are moving to the past and becoming a memory instead of today’s reality. Karen, every chance I get, I share with people our clinic experience in Spokane and how much your knowledge helped Accent and me to become partners not adversaries. I will NEVER be able to thank you enough! You helped to change my life, you helped Accent to bring out the calm happy horse that I knew was inside of him but couldn’t find." "I saw you for the first time at the Equine Affair in Springfield, Mass. I really enjoyed your presentation. (right down to earth). No matter how old you get that horses can improve your life. It even brought my husband and I closer because of the new passion." "Every horsewoman should attend a Karen Scholl clinic. Period, the end. Having said that, let me explain a little bit of why I personally think it's so true. I've been an avid horsewoman for over 25 years and learned more in a 3 day clinic with Karen than I have in all the previous clinics/seminars I have attended combined. It may have been that I was just ready to hear what she has to teach, but I think it's more to do with how she understands women and reaches out and teaches us to use our own voices to work with our horses. Karen uses exceptionally good teaching methods and really understands the special needs women have when working with horses and gaining their respect. She also has a very simple set of steps to follow that are easy to integrate and truly work. It also doesn't hurt that she's an exceptional horsewoman who chooses to share her love and knowledge of horse behavior with her students. " "Thank you for your smooth approach to horses and showing how you earn their trust. I'm 69 years old and have 6 head of wonderful horses that have been a joy to raise. I have ridden horse since I was able to get on one. I always wanted a great relationship with a horse. Watching you on RFD-TV is so pleasing. My wonderful Alpha mare and I still don't have a good relationship. I always thought it was because when I walk into the barn she resented me when she should of appreciated my leadership. I would like to have her glad to see me and pull away from me. THANK YOU FOR YOUR TAPES ON TV. I would like to see you in person or at a clinic. My physical handicaps (weight and knee) are starting to keep me from my pleasure and love. Thanks again for your teachings. Where were you 50 years ago. How I would have loved to had a teacher like you." "I thought Karen did a wonderful job addressing horse training from a woman's point of view. I think that women often have a hard time establishing leadership with a horse. We try to reason, empathize or coax the horse into doing what we want; usually with disastrous results. Karen was great at helping the women get over their hesitation at being firm but fair leaders to their horses." "What a great show on TV!!!" "... we both really enjoyed the 5-day foundation clinic. It really changed our approach to dealing with horses and created a mindset that is strengthening our leadership and confidence with our horses. In our first riding lesson after attending the clinic, a woman that rides with us commented to me that I appeared much more confident and less frustrated than I had been in prior weeks. She was right. Bill and I will continue to put into practice the skills and techniques we learned in the clinic as we continue our journey with horses... both current and future." "I have just discovered you! I am watching your programs and learning what I did not know I needed. Thanks!" "I attended Equine Affair in 2009 to take part in another clinicians demonstration. This was a very brave thing, as my Haflinger gelding has a terrible problem with pulling away under lead. There were not enough stud chains to stop him when he decided he wanted to go. It took 3 security men, my strong husband and a handful of carrots to get him to the main arena safely. After the clinic was over, I met Karen. She asked to use Schnapps for her next demonstration. "Have a great time", I thought to myself. Schnapps had other ideas, he bolted right down the corridor of the fairplex toward the barns. We caught him and brought him back, just in time for Karen to take over. In the matter of 45 minutes, my horse had a completely different mindset then I'd seen in the 3 years I owned him. I was so amazed I started crying. She very clearly showed us how to gain control and was able to not only demonstrate but also put it in a manner that was applicable to the "non-clinician" like myself. And what was more amazing, when I practiced what she'd taught me, it really worked. To this day, Schnapps is a better horse for it. This one day with Karen repaired a long history of bad behavior. Thank you so much for the difference you made in our lives. " "I think you are what I need to start enjoy riding with my family." "Please keep up the good work! More TV shows, PLEASE!!!! I'm so glad I found the University Channel on Dish Network . I tell people to watch your show if they have a child who wants to start watching the "horse shows" on TV because I think that you emphasize something that I haven't seen on any other show--your personal safety is tantamount to teaching the horse how to do something or to go somewhere. I really like your attitude about the practical stuff, such as using a packer's knot for the cinch, using a natural fiber cinch, make the horse help you put the saddle on, and emphasize that you have plenty of time to learn the advanced stuff--enjoying your horse should be why you have it! You give good, practical advice that EVERY rider should know, regardless of the type of saddle, instead of concentrating on learning how to do some fancy type of spinning or lunging. You also emphasize how to get into the MIND of a horse (you are so right about them being spooky about the silliest things, and them begging for a leader, be it human or equine). It is for these reasons that I think you have the best horse-oriented show on TV." "Really enjoyed your talk/demos at Festival of Horses. Looking forward to more." "Saw your show for the very first time tonight on TV and felt an immediate connection. As a first time horse owner and a green rider, Karen is exactly the person I’ve needed to hear. The guys are great, but... At last, a trainer who speaks my kind of language!!!" "... I woke up Saturday and was ready for at least 2 more days soaking of knowledge and not ready to go home. Did you hear Little Joe and I had quite the successful trailer loading experience? Thank you." "First of all, I want to tell you I thoroughly enjoyed all of your presentations over the weekend at the Equine Affaire in Massachusetts, and if I didn’t have to get back to my office job today, I’d be home watching your videos I bought on Saturday, and spending the time with my horse, applying some of the things that I learned from you over the weekend. I also enjoyed talking with you at your booth - you are so very easy to talk to, so down to earth." "Saw you at the Festival of Horses. It was very educational and I would love to learn more!" "I watched Karen at the Equine Affaire in Mass and really liked the way she saw that woman are different and I train with a very man attitude but he does way a soft way sometimes. I liked the way Karen bridged wanting the love of a horse but getting respect too." "The week long camp has empowered me with the education I need to better communicate with my horse. My little pony Pebbles wants to thank you for teaching me to communicate in his language. I have found the confidence I was needing and didn’t know I had in myself to further work with my horse and can not wait until the next advancing camp to feel the joy we have working together as partners. Thank you from the bottom of my heart Karen for showing me what was possible with my little horse. 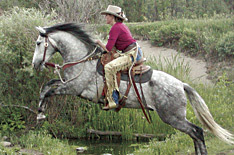 Karen really is a true horsewoman I would highly recommend for anyone who is looking for confidence with their horse." "I just watched your show on TV and wanted to THANK YOU. You are absolutely correct, women do want to know WHY when they train a horse...I thought your show was great and look forward to watching more of them. Keep up the great work. " "I walked into the living room expecting to see that man from Horse City (RFD) and there you were instead. I said “who is that woman? She is reading my mind and knows my needs.” You have inspired me and I’m getting your videos... Thanks Karen for being there." "Saw your program for the first time tonight on TV and was impressed how everything you said made sense to me. I was having an “ah ha!” moment! I wanted to try your lesson on my horse immediately, but I have to wait ‘til morning!" "I just wanted to let Karen know that I hitched up the trailer yesterday afternoon to reinforce our learning and had Jazzy hopping in the trailer after a minute or less. I didn't move my feet and kep the lead short and gave her a firm feel (not abrupt). I was tickled to remember and be able to ask her in. She was tickled too, to not play the crazy game. Thanks so much for a great week!!!!!" "I have needed your thoughtful woman’s perspective for a long time. Thanks! Your attention to detail and thorough “why” explanations make you an excellent presenter!" "When I saw you, I knew you had something very important to add to what I am doing and I love what you have to say. You are clear and from a woman’s point of view, this is just great stuff!" "Karen is non-judgmental, doesn’t yell, and she doesn’t make you feel like an idiot. She is not pushy, but she gets her point across. She allows you the luxury of absorbing what she is teaching at your own pace. She enabled me to do with my horse what I had been afraid to even try before. Karen Scholl digs deep inside of you and brings out your confidence, empowering you to be a leader to your horse. In only hours, the level of trust between me and my horse rose dramatically. She not only has a “feel” for horses, she has the same gift with people. She connects the two, and BAM! She draws out the best in YOU! Karen gives you the knowledge and skills to be safe with your horse. She is absolutely amazing. She genuinely wants you to be successful with your horse. Karen Scholl cares that you grasp what she teaches. She understands what you are searching for with your horse. In three days, she brought me (and my horse) forward into a new dimension-it was like time traveling! I attempted for three years to bond with my gelding. I read tons of horse books, purchased ALL “The Clinicians” DVDs, joined internet horse groups….trust me, I tried it all. I could feed and groom him, but I was afraid to do more. He was in charge, and he knew it. I loved him, but I wanted more than a pasture pet! I attended Equine Affaire in Columbus, Ohio, last spring. Honestly, I had gone to see another clinician. I had never heard of Karen Scholl. We happened by the arena where she was going to be with her Horsemanship for Women. I don’t usually learn well from women, so I was dubious. At the end of her clinic, I was intrigued. Several months later, I purchased her entire DVD selection. I actually made progress on my own with just her DVDs. Then, I signed up for her 3 day clinic in Sunbury, Ohio. Me! A woman that had never left the property with her horse! It is the best thing I have ever done in my life-period! And, I’m so happy that I went. I have never looked back, and I haven’t quit smiling (neither has my horse). It was almost, how may I say….MIRACULOUS! Karen Scholl is the best investment you can make for you and your horse." "The workshop for me was amazing. The way the horses reacted to every thing Karen was asking of them, truly was outstanding. The horses caught on so quickly that I was literally blown away. After watching the work shop and going back to my home arena, my horse Ginger is catching on much quicker because, instead of thinking of phase four as a whack, I now think of it as a "bite" which doesn’t make me feel so bad when I actually have to go into that phase. :) Also, realizing that my horses comfort zone is not right up on top of me has also put things in greater prospective. Thanks for everything :) "
"My daughter, Lynette is a 12 year old rider. She does not own a horse. I want her to have a deeper understanding of the relationship between a horse a rider as she rides many different horses in different stables and safety is sometimes an issue. Also this knowledge will improve her riding skills and her enjoyment when riding." "I just watched 2 videos you had made and finally after all these years you answered why I'm not advancing with my horse..she's not supposed to be a big puppy!" "Tying the Knot, what a great DVD. There are so many little tidbits that are so important for your safety as well as your horse. Lots of little things to remember that make big differences. This DVD is one that I will watch more then once. I think my favorite knot will be the bank Robbers knot. Thanks for all the good info."